National Flash Fiction Day UK 2018 erupts tomorrow – Saturday 16th June – with events across the UK and a special trio of celebrations in Bristol. The day unfolds with the #FlashWalk organised by yours truly. We invited competition entries on the theme of Urban Landscapes, between 40 and 400 words in length. Wonderful submissions arrived from all over the world, and we managed to narrow it down to 12 winning entries, which will be performed by our talented actors, Ashley Green, Christopher Ryan and Poppy Hocken, during the #FlashWalk. 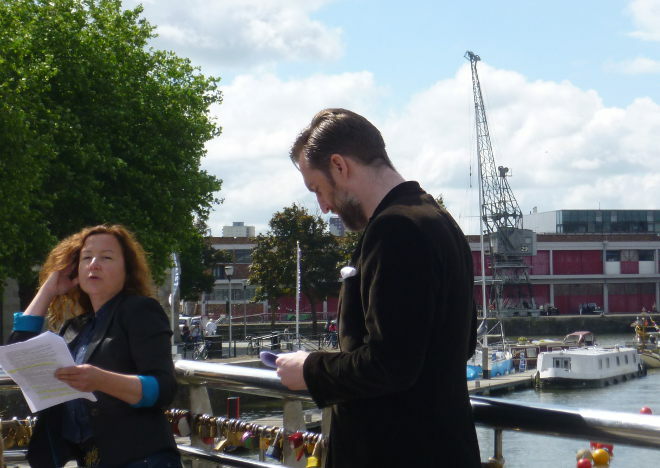 The fully guided #FlashWalk begins at 10.30am on 16th June, outside the harbourside entrance to Bristol’s M Shed. It will finish at the GreenHouse, Hereford Street, BS3 4NA (just under a mile’s stroll away), between an hour and an hour and a half later.